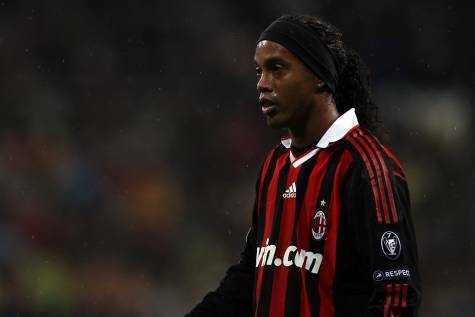 Ronaldinho Pondering Shock Premier League Move? Reports in the Italian press and The Daily Mail are suggesting that Brazilian pretty boy Ronaldinho is eyeing up one last challenge in England, before returning to Brazil to wind down his career a little closer to home – although some unscrupulous souls may say that he’s been ‘winding down’ his career for a good few years now. The 30-year-old’s contract talks at AC Milan are said to be stalling (Milan are trying to reduce his £135,000-a-week terms by 25%) and, should negotiations break down completely, ‘Ronnie’ will be seeking a move to these fair shores. Manchester United, Manchester City, Chelsea have all been linked with Ronaldinho in the past but the Brazilian’s star has fallen considerably since then. However, newly-promoted Newcastle have also shown serious interest in ‘Ronnie’ before, and a couple of the reports seem to think that The Toon may revive their interest and bring him in as a ‘marquee-signing’ for their first season back in the Premier League – although where the money would be coming from I’m not quite sure. Personally, I can’t really imagine him slotting into any current Premier League team, but the thought of Ronaldinho waddling down the left at the St. James’ Circus doesn’t seem too far-fetched. So, I’m going to open the floor to the Pies faithful here. Would you like to see ‘Ronnie’ trying his hand in the Prem, or is he just too far past it to cope with the pace and rigour of English football? Citeh’s chief exec is enough of a publicity whore to burden his club with a fat, overpaid has-been. So, he’s more likely to join the Eastlands circus. Dear God no! Don’t let him get anywhere near St. James! I would love to see Ronaldinho in the Prem……just not for Newcastle.